£7.99 free delivery in the U.K.
TWO BOYS, Colin Monro, a Protestant, and Tom O’Neill, a Catholic, both born at the beginning of the Second World War, become blood brothers in the innocence of childhood friendship. Both boys grow into men along with the expectations of their communities, Colin becoming an Officer in the Parachute Regiment and Special Air Service, Tom a solicitor and a leader of the Provisional IRA. Through their eyes and those of their family and friends we experience the influence of a closed environment on the social history of a Province, which can lead to man’s inhumanity, even to the people they love. It has been a long journey and because of that I have lived to see the light at the end of the tunnel gaining ground. As Bill Bryson says, "Growing up was easy. It required no thought or effort on my part. The Year 1969 was a very rude awakening. This book started off as a personal therapy and hopefully may be of help to all those who believe in a future. Strange to say, the book wrote itself. However, it was only through the help of friends that it survived. Those friends have my thanks already but it is good to declare it here in the open. My thanks are especially due to David Avery and Simon Palmer, my original mentors, Richard Roberts and our son Simon for their final push to finish at long last. They say behind every man there is a woman. Believe me, it is not always behind. This book fulfils a promise made a long time ago to my wife Rhena for her belief and understanding. Hope springs eternal. May that hope work for all those who have suffered and continue to suffer unmentionable pain, both physically and mentally. This is a well researched and thoroughly believable book with vivid characters and exciting plot which moves on a pace. A great read, highly recommended. Couldn't put it down. The style was sharp, controlled and easy to read. The innovative use of words is often brilliant presenting a vivid backdrop to the characters and plot, building to a spectacular conclusion, all of which would lend itself to conversion into film. A must read. What a great read. Very thought provoking and frightening to think what goes on behind the scenes. Can see this book being made into a film! 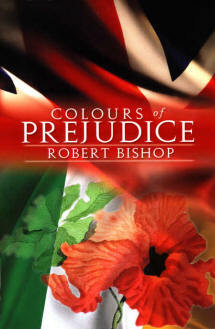 This novel offers a balanced and adult portrayal of a difficult period in the history of Northern Ireland. The story resonates with a depth of understanding of the forces at work on young men from the two communities and how they were shaped by them. I found it both sensitive and a ripping yarn which moved along at pace and held my interest to the end. A compelling read.